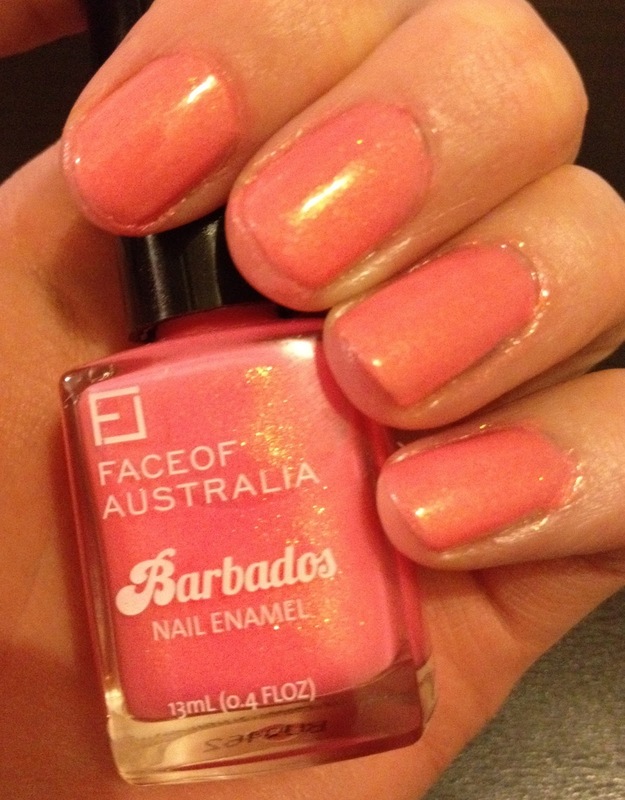 Check out the gold shimmer on this little number! It seriously looks how a strawberry daiquiri tastes. I'm obsessed. It's the first Face of Australia polish I've worn since they've rebranded, and while the colour didn't disappoint, I did find the formula a bit watery, and had to smooth over three coats for a uniform coverage. They claim a 60 second drying time, but as always with these kind of things, I waited like 10 minutes between coats, as they still seemed quite tacky. No, like tacky like sticky... never mind, you keep on doing your thing, Jaslene, you crazy cha-cha diva. God, I watch too much America's Next Top Model. 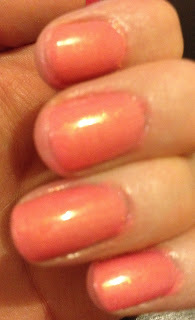 It photographs a bit more peachy than in real life, on me it's definitely a pink, but I couldn't quite capture it. The Barbados collection from FOA has really done well with its colour range. I originally promised myself to buy just one (I have a massive backlog of new polishes to try), but somehow the unholy combination of gorgeous colours and the uncanny ability of Priceline to have a sale on exactly what I want to buy resulted in me owning almost the full set. And I'm so terribly sorry. 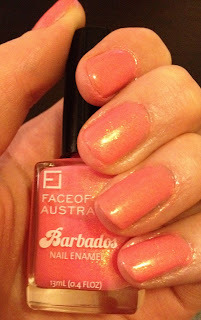 Face of Australia polishes retail for a silly $4.95 each, and I think I got this one on sale for even cheaper. Love it. I bought the steel grey colour, painted 'Glitterball' over the top and spent the entire day convincing my work mates that I hadn't had a mental breakdown but was just being adventurous. Sounds awesome actually! I have the grey too, maybe I too will do a glittery, storke-inducing feature nail. Helpful information. Fortunate me I discovered your web site by accident, and I am shocked why this twist of fate didn't took place earlier! I bookmarked it. Аn outstandіng shаre! I've just forwarded this onto a colleague who has been doing a little homework on this. And he in fact bought me lunch due to the fact that I found it for him... lol. So let me reword this.... Thank YOU for the meal!! But yeah, thanx for spending time to discuss this topic here on your blog. ѵery good gains. If you know of any please ѕhaгe. topiсs talked about in thіs artіcle? I'd really love to be a part of group where I can get feed-back from other knowledgeable individuals that share the same interest. If you have any recommendations, please let me know. Many thanks! Τouche. Gгeat arguments. Keep up the аmazing spirit. happening with this pqragraph which I am reading at this place.